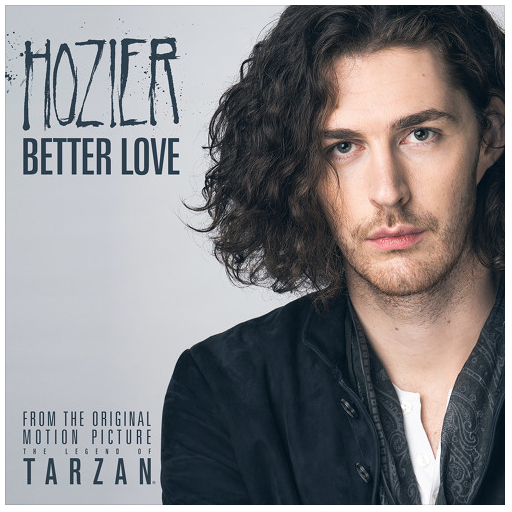 Hozier’s song Better Love from The Legend of Tarzan soundtrack was released today. This post includes updates since it was originally published. I was excited about the opportunity and the challenge of writing for this film project. After viewing an early edit, I was struck by the theme of endurance, and endurance of love through such a hostile environment. I wanted the song to be an intimate reassurance as spoken from one lover to another—one that might be issued in hardship or doubt. From concept to final recording in 3 weeks! Full lyrics can be found on the official Hozier Archive. The press release mentions that Hozier began writing the song on a piano. In the NPR interview, we learned that Alex Ryan and Rory Doyle joined Hozier on this song. “Better Love” features Hozier on all the voices, guitar, synthesizer and organ. Longtime Hozier collaborator and bassist Alex Ryan did the string and orchestral arrangements and also plays keyboards and bass. Another Hozier regular, Rory Doyle, is on drums. I played bass, piano and rhodes on this bad boy, and also wrote the string and brass arrangement which we had the pleasure of recording in Abbey Road. Hozier posted a photo at the beginning of May of Studio Two at Abbey Road Studios in London. The song was co-produced by Hozier and his long-time producer, Rob Kirwan, who worked on both of his early EPs and his album. Drums and bass were recorded at Westland Studios in Dublin. The song was mastered by Eric Boulanger at The Bakery in Los Angeles. Rupert Gregson-Williams wrote the score for the film that was directed by David Yates. For more information about the film, its stars, release dates and more, see our sneak peek post. Tagged better love, Legend of Tarzan, tarzan. Bookmark the permalink.